Ways to promote your crowdfunding campaign is the most popular theme on the blog. People jump into their campaign overflowing with enthusiasm but then realize how difficult it is to really get the word out. Then come the crowdfunding promotion scams and the industry gets a bad name on all the ways people use to take your money on the promise to promote your crowdfunding campaign. Hidden in all this is the fact that promoting your campaign can actually be enjoyable (dare I say, even fun) and really successful. Most people don’t often get the chance to reach out to thousands or tens of thousands with their message. You’re passionate about your campaign and most people love to talk about what moves them. Don’t become another crowdfunding statistic. Get everything you need to raise money in the crowd with Step-by-Step Crowdfunding. An Amazon best seller in the crowdfunding and non-profits categories with almost 1,800 copies sold. 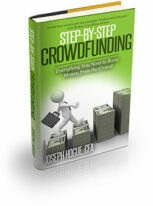 Click to get your copy of Step-by-Step Crowdfunding and learn how to promote your own campaign! 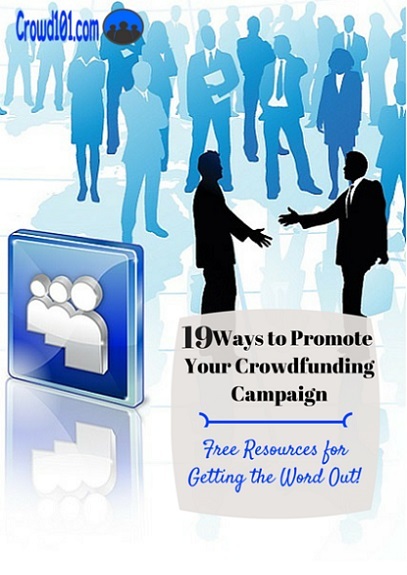 Before you put down your money even on the legitimate paid-promotion services, check out the 19 free ways to promote your crowdfunding campaign below. 1) Kicktraq is a website that tracks Kickstarter campaigns, providing some really cool information on daily pledging and estimates on how likely a campaign is to reach its funding goal. The site can actually be a good place to promote your crowdfunding campaign as well. Add your project to the site as soon as it goes live by simply putting the Kickstarter web address into the search bar. Campaigns added on their first day go into a special list that people can browse and the site has several other categories where your campaign can be found by visitors. 2) It would seem pretty obvious that I would add the Crowd101 blog to the list of websites to promote your crowdfunding campaign. I regularly post articles about campaigns and do interviews with campaign owners. To this list of crowdfunding-focused blogs, you can add names like Crowdfund Beat and Crowdbooster. There are a lot of websites that all they do is talk about crowdfunding and about projects. An important note, you need to understand what the blog and the readers want. If you’re talking to a group of people interested in crowdfunding then you’ll want to talk about crowdfunding, not just about your specific project. Even if you don’t directly say how awesome your campaign is, by talking about something that interests the audience you are much more likely to get your article read and shared. That means your short description of the campaign and link gets seen by more people! Besides crowdfunding blogs, you should reach out to other bloggers that write about topics similar to your campaign. This is really going to be the best audience you can find because the readers are already passionate about your idea. I talked about some ideas for guest posting and interviews in an article about how to draw people to your crowdfunding blog. 3) By far, the best website to promote your crowdfunding campaign is…your own! It is extremely easy to put together a simple website with a home page and a blog. Post to your blog once a week for a couple of months and you’ll start seeing people come to the site from Google search. I get about 70% of my blog’s traffic and thousands of visitors a day from Google. Starting your own website for your campaign is easy and will take less than an hour. You can use a lot of the videos and content you use on the crowdfunding page and other sites. About the only cost will be setting up website hosting from a company. 4) While it is generally for selling stuff, Craigslist can be a good resource to promote your crowdfunding campaign. You can post in the discussion forums or in one of the other categories. If your crowdfunding campaign offers rewards, try posting as if a reward were a product for sale to get people to come to your page. 5) YouTube is the world’s second largest search engine, second only to Google and is a great opportunity to promote your crowdfunding videos. One warning is that it can take a very long time to build a following on the site so start posting videos at least six months ahead of your campaign. Post short, informal videos about the topic and you’ll build a community ready to support your campaign. Social media is the Holy Grail to promote your crowdfunding campaign or to promote just about anything. Facebook alone has more than a billion active monthly users and dwarfs any visitor traffic you might get from your crowdfunding platform. There is an important note when it comes to social media groups and it actually applies to most of the ideas in the list. Groups focused on crowdfunding are great for getting advice about your campaign and can offer some benefits to promoting your message out. Check out the number of posts that just say, “Support my Campaign,” and you’ll get an idea how it might not be the best place to promote your campaign. A better place to look within social media groups (or blogs, or forums) will be the niche groups around your campaign topic. For example: if you are crowdfunding a cook book, you’ll obviously want to be active in cooking groups and other home-related groups. I’ve included here some of the best social media groups for general crowdfunding. They can still be a good resource for learning and to promote your crowdfunding campaign. Check them out but then spend some time looking for niche groups related to your campaign. 5) The Google Small Business Community isn’t necessarily a crowdfunding group but the page is extremely active and people love to talk about business ideas. There are more than 647,000 members and I get a ton of shares and visitors whenever I post in the group but you need to find a way to fit your campaign around the topic. 6) The Best Crowdfunding Community (it’s official name, I’m not calling it the Best) is one of the larger Google + groups with 12,505 members. The group is also more active than others I’ve seen and you can pick up some great ideas on how to promote your crowdfunding campaign besides just posting your link and talking about the campaign. As with all social media groups, be sure to answer questions from other members and be social besides just posting links to your own campaign. 7) The last Google + group I’ll cover is the Crowdfunding group with 10,707 members. It is not as active as the other two but still offers a good flow of information and a strong community. There are quite a few other groups in the Google community you might want to search for but make sure the group is active. 8) There are quite a few Facebook groups focused around crowdfunding but most have degenerated into spamming by campaign owners. I’ve included one group here that still provide some good information and might drive some traffic to your crowdfunding campaign. Crowdfunding: Kickstarter, Indiegogo and more is probably the largest crowdfunding group on Facebook with 11,800 members and I regularly see good information posted to the board. Even when just posting your link to the board, try to talk about your campaign a little and ask questions of the group to help engagement. LinkedIn has a stronger community of groups for crowdfunding than either Facebook or Google+. I post regularly to two groups and see campaign owners interacting quite a bit. 9) The Crowdfunding your Future group is one of the largest with 4,444 members and the group manager is fairly quick to accept new members. I’ve waited for weeks to join some groups so it’s nice to find one where the admin is on the ball. 10) The Crowdfunding – Kickstarter, Indiegog and more group on LinkedIn is also fairly large (3,648 members) and engaged compared to most other groups. 11) Don’t overlook Pinterest as a great place to promote your crowdfunding campaign. Crowdfunding is still a relatively small portion of the site but you can join group boards and post your own images from your campaign. I just started getting active on Pinterest a month ago and it’s already my third biggest source of visitors after Google search and regular readers. Check out the Crowdfunding & Crowdsourcing group board with more than 7,100 followers and be sure to join my crowdfunding boards, Crowdfunding Success and Fundraising the Crowd. Some of your best crowdfunding campaign promotion will happen offline. It’s the face-to-face interactions that will give people the confidence and trust in your campaign to fully support it online. 12) I talked about six guerrilla crowdfunding promotion hacks in a prior post that offers some innovative ways to promote your crowdfunding campaign. One of my favorite is asking people to wear a name sticker around for a day that says, “I support…” with your campaign name and web address. It’s a great conversation starter and works just about anywhere. 13) Your pre-launch party will be one of the most fun things you do crowdfunding and can raise a bunch of money for the campaign. It doesn’t have to be an expensive event. If you can round up a large group of people, most restaurants or bars will work with you for discounted prices on food and drinks. 14) Don’t forget your local newspaper and local shopper as offline resources to promote your crowdfunding campaign. If your campaign is for a local business or cause, this could be your best resource for promotion. Contact a few of the reporters to pitch your story and how it matters to the community. 15) It’s great if you can get a spot on one of the local TV morning shows but try contacting some of the public access shows as well. As long as you can relate your campaign to the show in some way, these shows are always looking for guests. Your best weapon for offline crowdfunding promotion may actually be online. It’s likely that most of the people on your email list are going to be local or within your personal network. This makes email messages extremely important for getting the word out on local events and rallying your list for your campaign. One of the most powerful places to find offline support for your crowd campaign is your local news and public access shows. These are obviously going to be much easier to get on than larger national shows but can be the stepping stone to taking your campaign viral. Integrate some kind of social mission or activity into your crowd campaign. This could be something like donating a part of the profits or giving free products to non-profits. Forums can be another great place to promote your crowdfunding campaign and are usually a little more active than social media groups. The same idea applies here where you’ll want to join a couple of crowdfunding-related forums and a few that are directly related to your campaign topic. 16) The Crowdfundingforum has 17,812 members and tens of thousands of posts with usually a couple of hundred members online at any given time. You’ll find posts for general crowdfunding questions, project manager tips and on different types of crowdfunding. 17) The Kickstarterforum is not affiliated with Kickstarter but most of the posts focus on rewards-based crowdfunding. It’s smaller than the other forum but still relatively active and can be a good resource. 18) The Crowdfunding subreddit on Reddit is not supposed to be for advertising your project but you can post links to your articles from your blog. This gets people to visit your blog or anywhere you’ve talked about your campaign and could result in a few visits to your page. 19) The Kickstarter subreddit on Reddit is much larger than the Crowdfunding subreddit and has more than 29,500 subscribers. You can post links to your Kickstarter or Indiegogo campaign as well as post campaign updates and ask crowdfunding-related questions. Should You Use Paid Promotion for Your Crowdfunding Campaign? I know this post is all about free ways to promote your crowd campaign but there’s also a place for paid promotion strategies. You might feel like your budget is stretched thin after paying for rewards and maybe a little help on your campaign but a little in your marketing budget can go a long way. I use YouTube and Facebook ads to promote my websites and projects. You will pay between $0.005 to $0.02 per view on a video and can convert a lot of those views to followers. Engage with your community and you’ll be able to turn those followers into an army of help and support. Take the time to develop a professional-looking video for your ads. I use FB and YouTube but you might also consider other social networks for paid advertising. 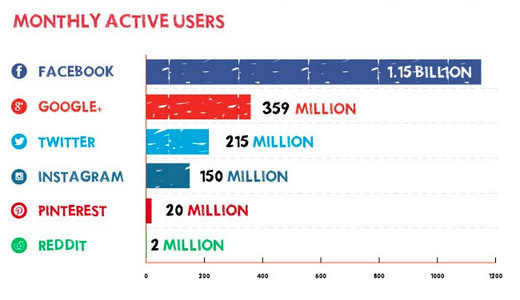 Most of the time, it comes down to on which platform you already have the most support and following. Leverage your existing community to help your ads go farther and engage with your new followers. I don’t generally recommend hiring a crowdfunding PR company because most don’t do all they say. The best use of your money is usually hiring help directly from your community of supporters. Friends and family are cheaper, but their heart may not be in the project. Hire from your motivated supporters and you’ll get better support for your crowdfunding campaign. If you do decide to ask a crowdfunding PR company for help, there are some things you should watch for when comparing. Most of these companies are small, one-person companies that are more interested in your money than your campaign’s success. A few of the crowdfunding PR companies you might consider are Command Partners, Funded Today, CrowdBooster and GoGo Starters. I haven’t tried any of these promotion companies so make sure you check them out thoroughly. One thing we haven’t talked about is the importance of having a rockstar pitch while you’re promoting your crowdfunding campaign. Of course, it does no good to get viral traffic to your crowdfunding page if people just click out after reading it. Your crowdfunding page needs to be a compelling story with a mix of video, content and graphics. It needs to share the emotional reason behind the campaign and why visitors should make it their mission. After all this work, you’re still not quite done if you want to raise as much money as possible. Make sure you reach out to donors, engage them with questions and conversation. Asking and answering the right questions is going to turn these random donors into supporters that will pass on your message for even more free promotion. This list of places to promote your crowdfunding campaign should get you started in getting the word out and give you a few more ideas for promotion. Remember, there really is no ‘crowd’ in crowdfunding until you create it. You need to promote your crowdfunding campaign out to as many places as possible to reach as many people as possible. Studies show that only about 2.4% of the visitors to a Kickstarter page become backers so you need to drive some serious traffic to meet your funding goal. Check out one of our most popular posts, 33 Expert Tips to Boost Fundraising Ideas and Crowd Campaigns, for more ideas on reaching the crowd. You are just a power house of information. My browser is filled with tabs of all your articles, as I click though to continue reading. Thank you so much for these great tips. Some I already knew and have implemented. But some I learned here. Like I didn’t know that websites like crowd101.com promoted crowdfunding sites. Yay! It would have been nice if you gave us some tips on how to submit, but I guess you didn’t want to come across too self-promoting. I am going to continue reading to find out how to get your site to promote my crowdfunding campaign, but overall, great set of articles! Thanks for the kind notes Joan. I hope the articles help you raise money crowdfunding. It really is a great new way to launch projects but so many have been disappointed. Use the process and you’ll be well on your way fundraising. Thanks again. Great article, Joseph – very thorough. We had luck using Reddit advertisements, and Coolbacker.com. Hootsuite is definitely a must! Your suggestion to use Craigslist is interesting – would you extend that to other classified apps like LetGo, OfferUp etc? Thanks for the comment. I haven’t looked at other classified apps to promote crowdfunding campaigns but I imagine they could work. The problem is you really have to manage your time with campaign promotion. Craigslist gets good monthly traffic and might be worth a little time promoting but I’m not sure the other apps get enough visitors to really be worth the effort. Love the idea of using Reddit for crowdfunding community building and will have to look into their advertising offer. Thanks again. Newbie here, trying to navigate the waters of Kickstarter! Thank you for the advice, you gave amazing direction, and I am utilizing most of these, due to your suggestions! Fingers crossed!